The follow up to 2005's Sin City finally hits theaters, despite being announced almost immediately after the original. Sin City: A Dame to Kill For is literally more of the same. Like its predecessor, this is an anthology film collecting several interconnected short stories which originally appeared in the comic book series of the same name. Some of the short stories here take place before those in original film, some after. All of the stories follow the denizens of Basin City, better known as Sin City. It is a place filled with crime, corruption and debauchery. Basin City is a nightmarish fever dream that exists out of time and space. Clothes are vaguely contemporary yet cars are all classic models, from 40s to the 70s. No one carries a cell phone yet modern guns have made their way into town. 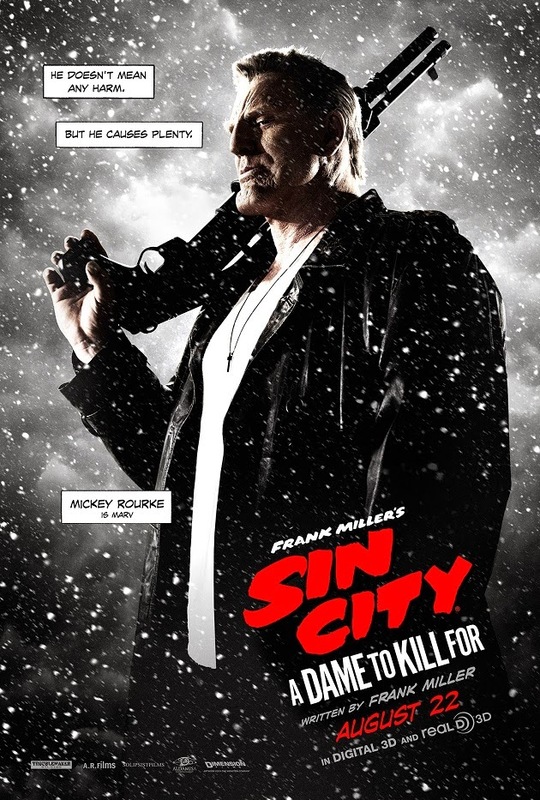 Seemingly an amalgamation of the worst, most stereotypical elements of New York and LA, Sin City is the type of urban nightmare which comic book author and screenwriter Frank Miller is famous for. Simply by virtue of appearing in every short story, the chief protagonist in this ensemble film is likely Marv, played by Mickey Rourke. The chief antagonist is Senator Roark, one of the most pessimistic depictions of an American elected official ever committed to digital celluloid. The short stories include the titular "A Dame to Kill For," "The Long Bad Night," and "Nancy's Last Dance." The best of the three is the newly written "The Long Bad Night." It follows a rounder who never loses, even at slot machines. Johnny (Joseph Gordon-Levitt), finds the ultimate game when he bets it all in a back room poker game against Sen. Roark. In "Nancy's Last Dance," also a new story written specifically for this film, Nancy Callahan (Jessica Alba) plans revenge on Sen. Roark for events which took place in the first film. Surprisingly, "A Dame to Kill For," is the weakest link in the film. Following Dwight, played by Clive Owen in the original and Josh Brolin here, this storyline finds him investigating a femme fatale and ex-lover who claims to claims to be in over her head (like all femme fatales...). Ava, played by Eva Green, has a story that doesn't add up and a severe allergy to wearing tops. Like the original film, this entry in the series not only pays homage to the film noir genre, it distills to it's primal core: a nightmarish cityscape filled with violence, all depicted in glorious black and white. The first film was widely lauded for its style, and the style and tone isn't much different here. Unfortunately, Sin City 2 is far from perfect. It suffers from pacing issues particularly in the middle section, the so called "Dame to Kill For." It is overlong and has too many subplots. Like most Robert Rodriguez films, this one is packed from frame to frame with famous faces. Ditching some of them might have reduced the star power but have also made for a more concise viewing. Furthermore, not all of the characters here are not portrayed by the same actors. Keeping track of who is who and when will be difficult for all but the most ardent fans. Those who liked (and loved) the original film will appreciate this film or at least elements of it. Unfortunately the hyper violence, sluggish middle chapter and plotting that spins two films are unlikely to appeal to anyone else.